Tel Aviv, Israel Oct 1, 2009 – Targeted Technology Solutions, LLC’s myPC™ and KIDO'Z are proud to announce the birth of their brand-new Toddler Computing Solution. The two companies are bringing their complementary technologies and expertise together to make the computing experience even safer, more educational and more interactive for toddlers. Based on the agreement, myPC Stage One Keyboards will be marketed and packaged with the KIDO'Z software. Parents will simply need to install/download KIDO'Z, complete the easy registration, and start using the application. The value-add is that end-users can now enjoy the benefit of a total 'toddler-friendly' solution from both a hardware and software perspective without needing to search for additional tools. The KIDO'Z Kids Web Environment brings the Internet to kids in a safe, fun and kid-friendly way. The graphical user interface is designed for kids as young as 2 years old, and content can be personalized according to age group, among other variables. What this means is that even toddlers can surf websites, watch videos, and play games independently and safely. Kids are kept safe in the KIDO'Z environment and cannot exit the application without parental permission. The myPC Stage One Keyboard is a personalized computer keyboard and ergonomic mouse system designed especially for toddlers' learning styles and lifestyles. Practically indestructible and with colorful 'key' features designed especially for ages 2 and up, kids and parents alike will love this toddler-friendly computing experience. As toddlers are naturally exuberant and inquisitive (and seem to have a knack for technology), the fact that the computer will be protected both inside and out will make this solution even more desirable to parents. Sticky fingers, files deleted, accidental spills, and settings changed are all a worry of the past. Kids will love being able to do 'just what mommy and daddy do' on the computer but with their very own hardware and software tools and content. “We are so excited to bring together the myPC Stage I Keyboard with KIDO’Z! It is a perfect marriage of hardware and software that will enhance children’s entire technology introduction and experience. We are confident that children and parents alike will appreciate all of the new features and benefits that this partnership affords them.” - Elizabeth Tarpley, CEO, Targeted Technology Solutions, LLC. The KIDO’Z Kid's Web Environment is developed by KIDO'Z Ltd, a Tel-Aviv based company managed by parents and top industry professionals. KIDO'Z is the first international Web Operating System for young kids between the ages of 2-8 years old, which allows young children to safely and independently browse the web, play games, watch Youtube videos, and interact with friends in a safe, protected environment. The user interface is kid-friendly and graphical in nature, and as such, is optimized for fun and independent navigation. Parents remain in control through the password-protected Parental Control Account, where they can add content, block content, adjust security settings and more. KIDO’Z is available in 17 languages with content added in over 30 languages, making it a truly global solution. KIDO'Z is PC, Mac and Linux compatible and is available as a free download from http://www.kidoz.net/. 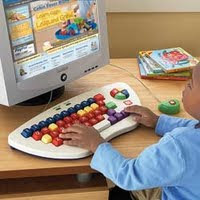 The award-winning myPC Stage One Keyboard and mouse is a product of Targeted Technology Solutions, LLC, which was started and is managed by a mother and industry expert.The keyboard is sealed, spill-proof, and even washable, with jumbo keys designed for toddlers as young as 2 years old. It is also color-coded for ease of learning and comes with a kid-friendly ergonomic mouse. myPC is Plug-and-Play and is Windows and Mac compatible.myPC is currently available for purchase through multiple distribution channels as well as direct from http://www.mytechstart.com/.